In this image we can see the asterism of the "Summer Triangle" a giant triangle in the sky composed of the three bright stars Vega (top left), Altair (lower middle) and Deneb (far left). The famous "Summer Triangle" will appear overhead around 9:30 p.m. local time this week. The summer sky landmark is not a constellation itself, but rather three bright stars from three separate constellations. The pattern is nearly isosceles, which means it appears as a triangle with two equal-length sides. Brightest of the three is the bluish-white Vega, in the constellation of Lyra, the Lyre. Next in brightness is the yellowish-white Altair in Aquila, the Eagle. Finally, there is white Deneb in Cygnus, the Swan. To our eyes, Vega appears twice as bright as Altair and more than three times brighter than Deneb. 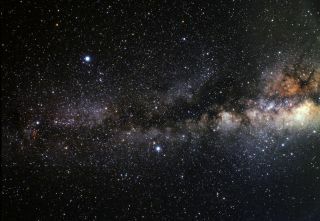 A special treat of the Summer Triangle's noticeable prominence in summer months is the visible framing of the Milky Way between Vega and Altair. Deneb appears to lie in the middle of the Milky Way's dim band. A symbol of the summer . . . or fall? Although "Summer" Triangle suggests that it's a star pattern most favorably situated during the warm summer months, that is not entirely true. During July, it is visible during the entire night. By the time we get into September — a transitional month where we officially move into fall in the Northern Hemisphere — the Triangle continues to stand high overhead soon after darkness has fallen. To this end, some might argue that it should really be branded as the "Autumn" Triangle. However, on the day of the autumnal equinox, the Triangle has already begun to disappear below the west-northwest horizon by the break of dawn. So, unlike during the sultry nights of July, the Triangle does not remain in view from sunrise to sunset as the leaves begin to turn. But even as late as mid-November, stargazers can still see the Triangle in pretty much the same position that we would see it this week during the middle to late evening hours, though by mid-autumn this view will more closely correspond to dusk (around 5 p.m. local time). There is some debate as to who first christened the bright stellar trio of Vega, Deneb and Altair as the Summer Triangle. Some say that the legendary British astronomer, Sir Patrick Moore (1923-2012), was the first to coin the term. Noted Moore: "During a 1958 television broadcast on the BBC, I introduced the nickname of the Summer Triangle and everyone now seems to use the term, even though it is completely unofficial." However, several years earlier, in 1954, in his popular sky guide "Find the Constellations," H.A. Rey (1898-1977) also used the Summer Triangle moniker. Still others believe that the term was popularized through U.S. navigator training manuals during World War II. Interestingly, Romanian astronomer Oswald Thomas (1882-1963) described Vega, Altair and Deneb as "Grosses Dreieck" (Great Triangle) in the late 1920s and "Sommerliches Dreieck" (Summerly Triangle) in 1934.